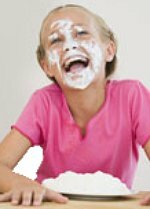 Messy party games and fun and memorable. 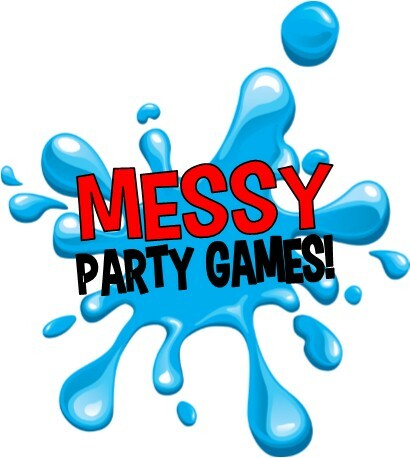 The following messy games are perfect for kids parties, but the best thing is that most of them are also great fun for TEENAGERS and ADULTS. 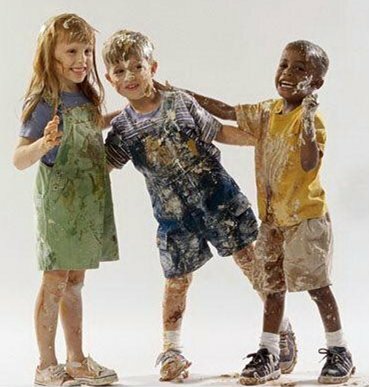 So if you want to make it fun for all to participate these games are sure-fire winners, that is of course if you don’t mind getting a little messy! Most of these games are D.I.Y party games, perfect for the do it yourself at home party. You will find games for both indoors and outdoors, plus our new party tool bar at the bottom of the page can help you find all the supplies you might need at the BEST price. Have Fun! Make sure you have your camera ready for this hilarious and messy party game. All participants site at the table with their hands behind their back. Whipped cream pies are placed in front of each contestant and the fun begins on the start of go. Everyone dives head first into their pie to retrieve the gummy bears buried underneath all the whipped cream. 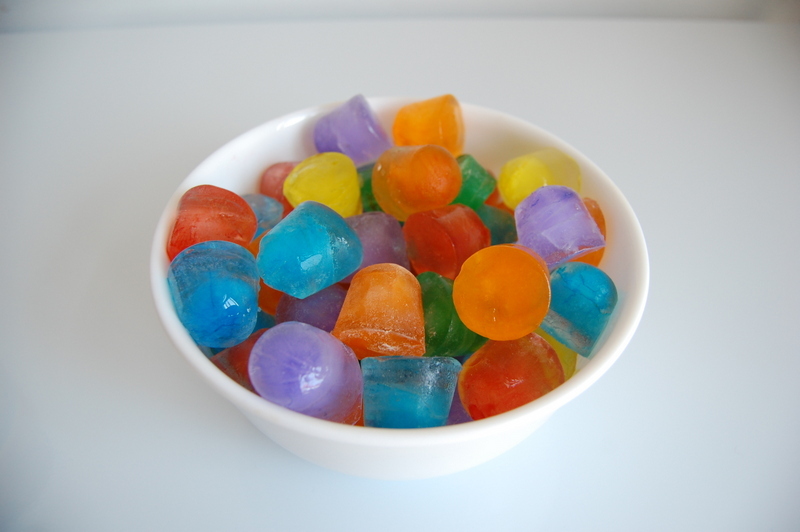 The first one to pull out and eat all 10 gummies WIN! TO PREPARE: You’ll need enough pie tins so that each participant has one (you can also just use paper plates). You’ll also need ten gummy bears for each pie, and enough whipped cream to fill each pie tin. In this messy game children are divided into pairs and presented an ice cube on a paper plate. The ice cube has been colored with food coloring and in the middle of it is a penny. The object of the game is to be the first pair to retrieve the penny by melting (not breaking) their ice cube the fastest. This game gives the children a chance to be creative and come up with a strategy together. You do not have to color the ice cubes, this is done to make the game more visually fun. For every participant you will need one donut. Hang each donut from the ceiling or a tree branch using string or ribbon. 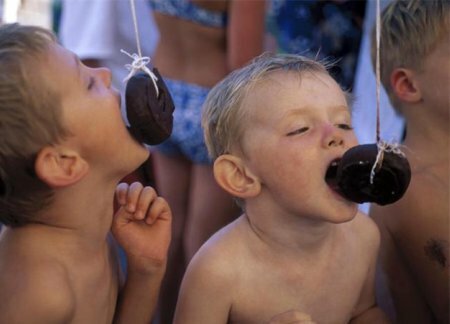 Make sure each donut is hanging low enough that each child can touch it with their mouth. To Play: Each participant takes their place in front of a hanging donut and places their hands behind their back. On the start of go they each try and eat their donut (without touching it with their hands) as fast as they can without dropping it. First one who finishes wins! Don’t waste your money on the cheap yellow strips. Instead create your own slip in slide by using a large car tarp (or tarps). Lay it across your yard, hose it down, pour on some baby oil or dish soap to make it more slippery, and let the fun begin. Add some water balloons and/or water guns and the party will be made. WANT TO MAKE IT MESSIER? Instead of water cover it with pudding, jello, or oily spaghetti noodles! Yes it’s messy, but nothing that can’t be rinsed off with the hose plus it is something the kids will NEVER forget. A food fight is about as messy as it gets. Some things to think about if you want to get this messy is what foods you want to provide for throwing. Some popular food fighting foods are jello, peas, pudding, popcorn, spaghetti noodles, any food that won’t hurt. Consider providing goggles for eye protection and garbage bags to wear over clothes. A suggestion to make clean up easier is to have the food fight outside on cheap painters tarps that you can roll up and throw away after the parties over. Have each child wear a white t-shirt that is ok to be colored. Divide all the kids into two to three teams. Each team is given a color and a water gun for each player. The water guns will be filled with water that has been dyed with food coloring to represent that teams color. The object of the game is that of a paintball game, each player must try and tag other players with their color to make them “out”. For water shots to get another player out it must hit on the back, chest, or stomach. Arms and leg shots will not make another player out, and head shots are not allowed. The last player left in the game represents the winning team. This is an indoor party game. 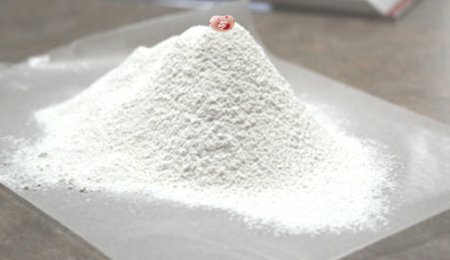 To play you will create a mound of flour to look like a mountain of flour. This is best done on a cookie sheet or wax paper to make clean up easier. Flatten the peak of the mountain a little, or create a small pocket indent on the mountain tip to place a jelly bean or jelly belly in. TO PLAY: Players pass around a spoon and take turns removing a spoonful of flour from the mountain. The player that eventually makes the jelly bean fall must dive into the flour and find and eat the jelly bean using only their mouths! After throw away the flour, create a new flour mountain and play again. Divide participants into pairs. Line all players up facing their partner. They should be about 2 ft apart to start the game. Give each team a raw egg. They must toss the egg back and forth without breaking it, after each toss the partners take a step away from each other. The winners are the team that gets the most distance between them before dropping the egg. Fill a bowl full of boiled eggs and ONE raw egg. Brave participants take turns choosing a cracking an egg on their head until finally the raw one is chosen. Set up a tarp to contain the mess, and let the kids take turns throwing eggs at a fun target. Give each participant a spoon with a raw egg on it. They must hold the spoon while racing each other to the finish line and back without dropping their egg. 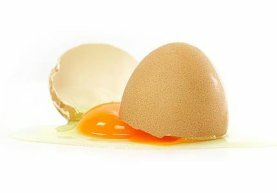 If an egg is dropped they must go back to the beginning and start again. Bowl of Cereal Fill a kiddie pool full of water, powdered milk, and generic frosted flakes. Have the children crawl through it on their hands and knees without spilling a drop. Feet of Steel Fill six buckets with water and ice and set them up in two rows of three. To pass through this obstacle the children must race through the buckets by placing one foot into each bucket as they pass it. Shave the Balloon To pass this obstacle the children must slather shaving cream onto a balloon and make three swipes with the razor - without popping it. Draw a face on the balloons before hand to add a little extra fun. Balloon Pop In this obstacle course challenge the goal is to bust the water balloon by sitting on it. Spaghetti Pool Fill a kiddie pool with cooked spaghetti noodles and oil. 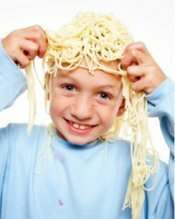 To pass this obstacle course challenge the child must find at least one meatball (bouncy ball) hidden underneath the spaghetti to move on. Ok, this isn’t a game, but it is a fun, messy, but oh so yummy activity that will be a blast at any party. Create an Ice cream Sundae Bar and let the children make their own sundaes or banana splits. Provide tons of flavors and topping choices and let the kids have at it. You could even give out prizes for most original, creative, tasty, colorful, or even gross ice cream sundaes.